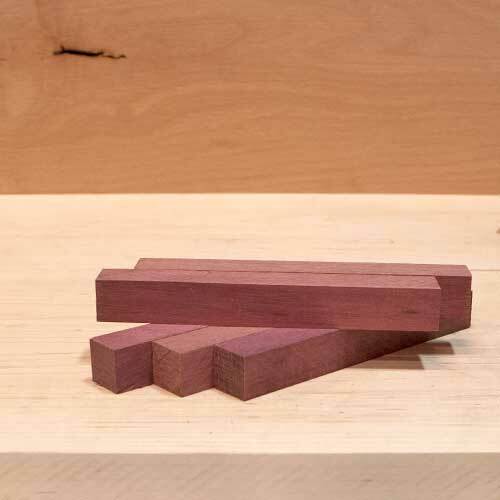 These Purpleheart Pen Blanks are more harder to work than other woods. It turn well but is not easy to sand. The heartwood is bright purple but darkens to a deep purplish brown on exposure. The sapwood is an off white. The grain is straight. The texture is fine. USE Coupon Code: PENB15 to SAVE 15% off sale of $30.00 or more in Pen Blanks! Not sure how to get started? Click here to check out this great video done by Gwinnett Woodworkers on the basics of making pen blanks. * Carving and Turning Blanks maybe sawn up to +/- ¼” of size listed. These Purpleheart Pen Blanks are for turning on a lathe. They may not be exactly square and could vary a slight amount in length and width. If you have specific requirements please contact us. You can also place instructions in the order notes box at checkout. Volume discounts are available on bulk purchases of 100 or more pen blanks of a single species or mix and match. Please contact us for more details.